SAN DIEGO, CA, September 01, 2017 /24-7PressRelease/ — Thanks to a generous gift from Pardee Homes, Santee Lakes Recreation Preserve recently unveiled its new bike repair station. The station will provide riders with equipment to fix their bikes and make needed adjustments while exploring Santee by bicycle. With biking’s popularity continuing to grow in the region, the bike station provides a much-needed quick-fix station. 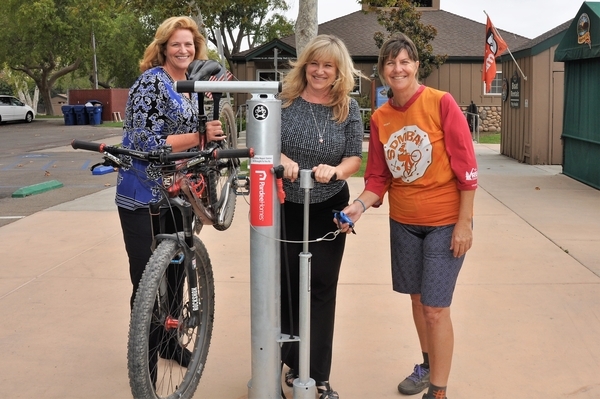 The bike station is another example of Pardee’s commitment to the Santee community, which in recent years has included support for youth sports, Mission Trails Regional Park and the Santee School District Foundation, among others. The new bike repair station is mounted near the General Store located at Lake Five. The facility provides a useful platform that allows a bike to hang freely so a rider can perform a basic visual inspection or repairs, such as adjusting brakes and derailleurs or fixing a flat tire. The station also comes equipped with an air pump to inflate tires and several common tools needed for bike repairs, including wrenches, screwdrivers and tire levers. The tools are securely attached to the stand with stainless steel cables and tamper-proof fasteners to ensure the station’s longevity.